nice Brown rookie.. i picked one up last summer ungraded.. corners aren't near as nice.. prolly grade about 3.5-4 i'd assume. Cannot do better than that: Brown is the Michael Jordan of FB as far as I am concerned. I finished my run of regular issue Topps/Fleer/Phila. Brown cards recently. Need a 1961 IA to finish the regular issue Topps run as far as I want to take it. Still working on the Kahn's, team issues, and Carlings [though at their sizes I may not bother]. I took a road trip (6.5 hour drive) to the Raleigh NC card show this weekend, and came away with a bunch of football cards including these low grade beauties. 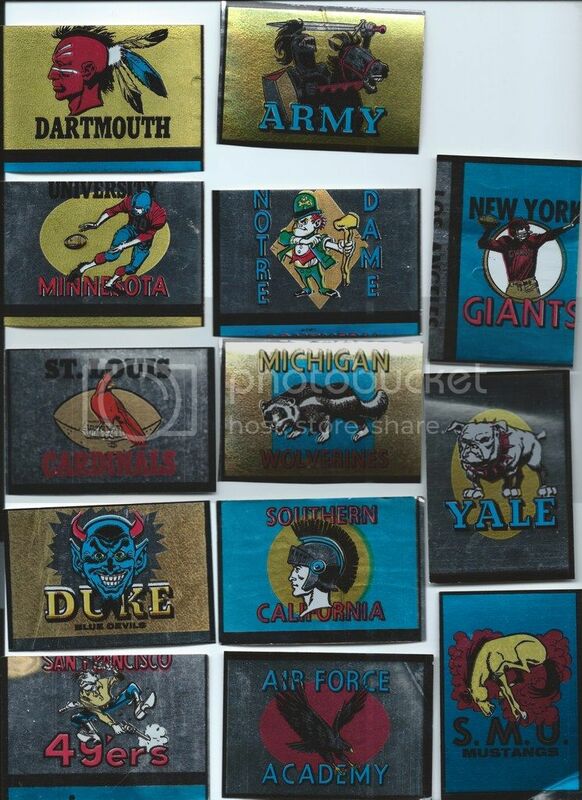 These are all tough short prints (numbers divisable by 3) NM condition can go for $100. Found in Kurt Turdots "bargain box" $5 each but I had to give $15 (maybe $17) for Conerly RC but I was glad to get them! 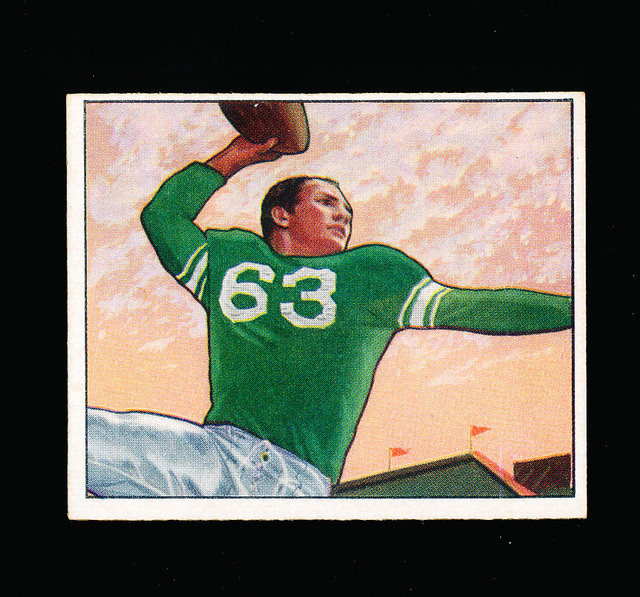 1964 Philadelphia #17 Mike Ditka (another $5 bargain box pick) finished my set! 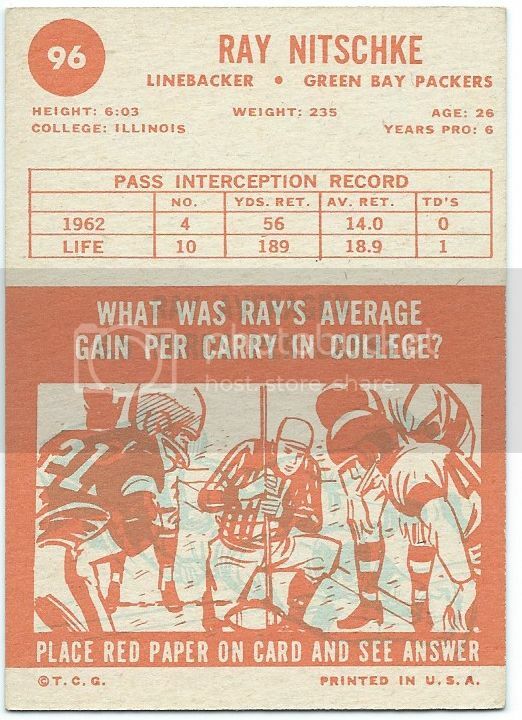 1966 Philadelphia #38 Gale Sayers RC. I had to pay a bit more than $5 for this off grade example but I was glad to get it! I just need FOUR more cards to complete the 64-65-66-67 Philadelphia sets! Last edited by Robextend; 02-02-2015 at 01:15 PM. Gonna have to snag the Sayers and Butkus rookies somewhere down the line. I don't normally buy graded cards unless they're listed cheap.. just picked this one up to help my '59 set along.. Cool Butkus & Sayers auto rookies, Rob. 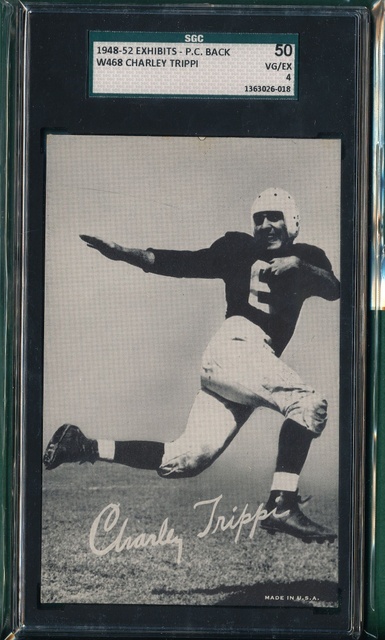 Nice Ditka rookie.. yet another card i want along with the Fran Tarkenton. I like the action shot on the side.. Picked this Exhibit card up this week in an auction. Postcard backs for these exhibits are really tough. This is a fun set to talk about too! 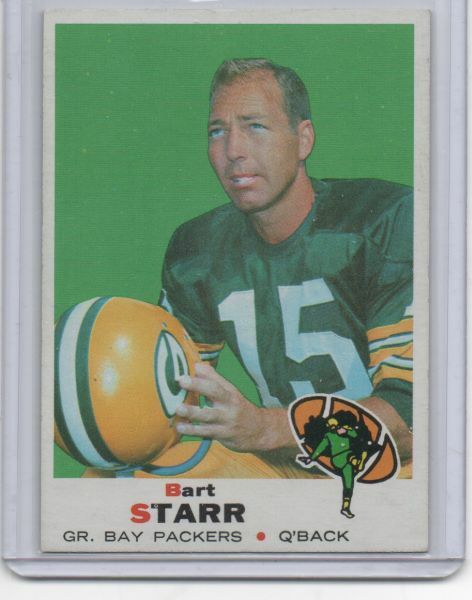 I have been getting rid of my football cards to streamline my collection, but when I saw this card. I just had to have it. somewhere i heard or read that's his cadillac in the background of that photo. i think several of the players are pictured with it. what are you streamlining to.. if i may ask? i've got a lot of cards left over from packs.. i just started making sets..and boxes with leftovers and doubles. Last edited by sockwell123; 02-08-2015 at 03:38 PM. 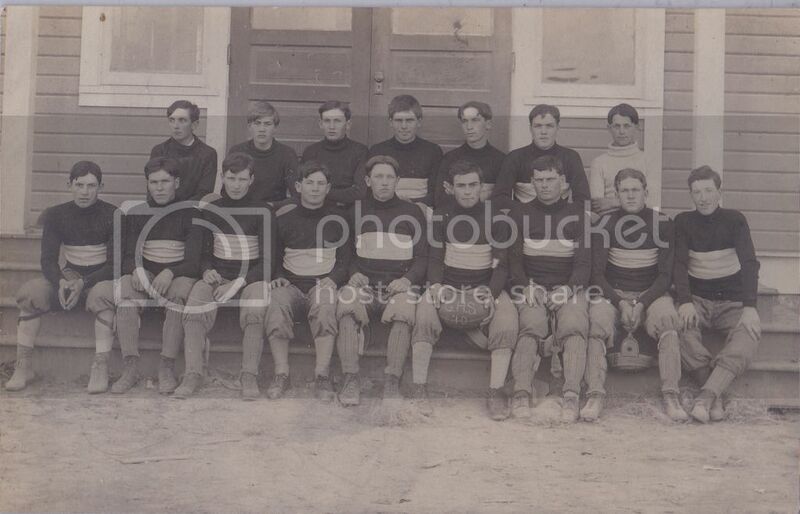 Baseball and specifically Detroit Tigers. Almost done with post war. My side ventures are 1952 and 1958 baseball sets in low grade and 1967 in high grade. cool beans. I'm wanting to put a '58 all star "set" together. i've got one card.. the Warren Spahn. Will take me a long time as I will just pick em up if i can get em cheap..
Last edited by sockwell123; 02-11-2015 at 11:59 PM. Last edited by mart8081; 02-12-2015 at 03:27 AM. brewing - heading in the wrong direction if you're culling out your football cards! 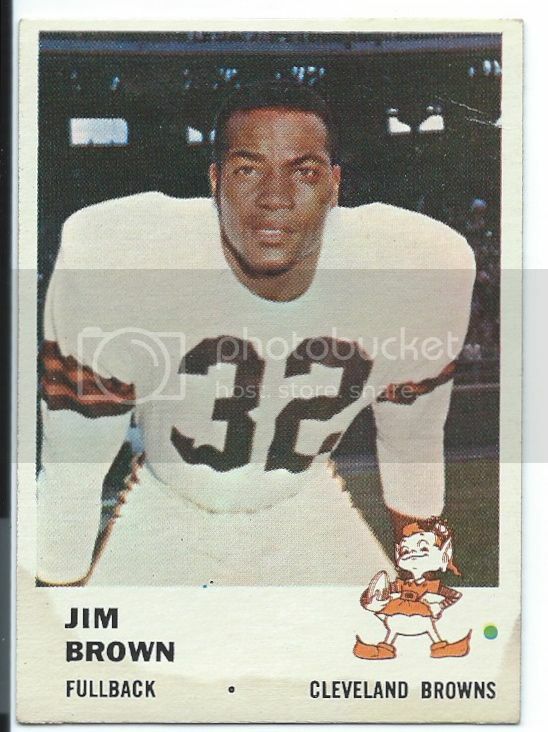 Stick around and check out some of the stuff posted in this Forum and maybe you'll change your mind That Jim Brown is a killer! Love the Chicle, 1957, '55 AA sets so these cards are great! Totally agree. I would like to get into the pre-war and post 50's for sure.. maybe one day when i've finally caught up on the 70's. picked this up.. It's not a card but a signed print from Ike Rodriguez.. maybe one day i'll be able to hang it somewhere when i've got my cave. I am continuously amazed at the prices on vintage football HOFers. It is not unusual at all to be able to pick up guys like Marchetti, Berry, Perry, Tunnell, Lane, Lary, and dozens more for common prices or very close to it. For example, this weekend I picked up a 1957 Marchetti in Vg-ex for $1.36. I got a 1963 Marchetti for 99 cents. I snagged a 1966 Keith Lincoln in Vg-Ex/Ex for 6 cents plus 25 cents shipping. I can remember hearing how football cards were underpriced in the 1980's. Well, as I am closing in on completing my sets for the 50's and 60's, I want the good times to keep rolling. Talk about Matchbooks lately has made me go after some. I hear you, Sam! It amazes me how reasonably priced most 50s and 60s football is compared to baseball. High grade HOF RC are the exception due to the "registry people". I believe football is still significantly undervalued and has a lot of upside. 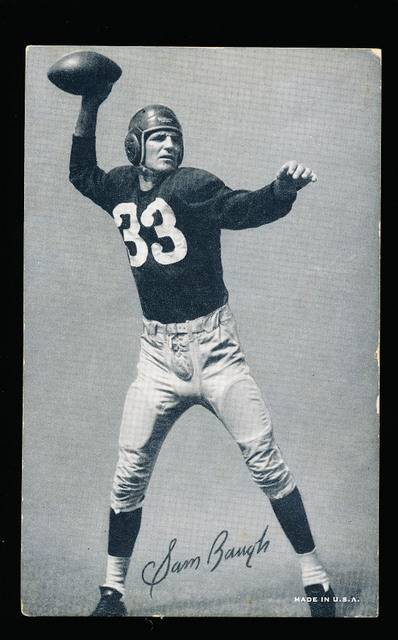 I love the 1950 Bowman's, whether it's football or baseball, the pictures are perfect. I would eventually like to pickup more, but for now these will do. Nice cards Jason, I agree on the '50 Bowman's. It's my football set. Here's a couple of recent additions with a 50 Bowman Tittle and an Exhibit Baugh. Four more for the set - now at 58/100 (not counting the Tinsley or White errors) with Luckman incoming. Nice AA cards! I have the Hein and the Hutson and when I bought the Hutson, it was labeled as a "short print". Anyone know the story behind that? Something with the sheet layout? 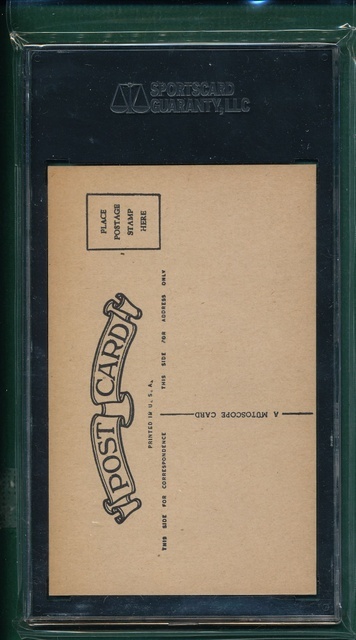 This card arrives today via eBay, leaving just eight cards left to complete the 1961 Fleer set. Last edited by NewEnglandBaseBallist; 03-13-2015 at 08:59 PM. Recent addition that I got graded, easily my cleanest Leaf. Wow, the borders on that Walker are really white. Nice card! +1. Wow the color really pops on that card. Great card Jason, that's one of my favorites. Haven't really acquired much lately due to not much money. One card closer to finishing my 69 set though. And a RAMS set of the Fleer wallet photos for my RAMS collection. In the same boat as not much money for cards lately...ne'er seen those wallet photos. Cool beans. Last edited by pariah1107; 03-20-2015 at 02:40 PM. Scan is a bit large - sorry!!! 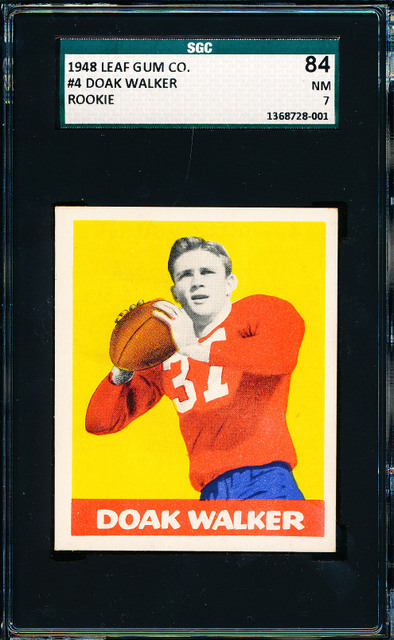 I picked myself up a Luckman also; along with a Bobby Layne. 2 new ones for my signed HOF'er collection. Down to 22 needed to complete. That said, only cards, only players/coaches & financially feasible (for me). It's been a lot of fun hunting them down. Today at my monthly local show, I finished my 1963 Topps set This certain dealer is always set up, and none of his cards have price tags on them. When he gives you a price, it's always high, and I've never bought a card from him. 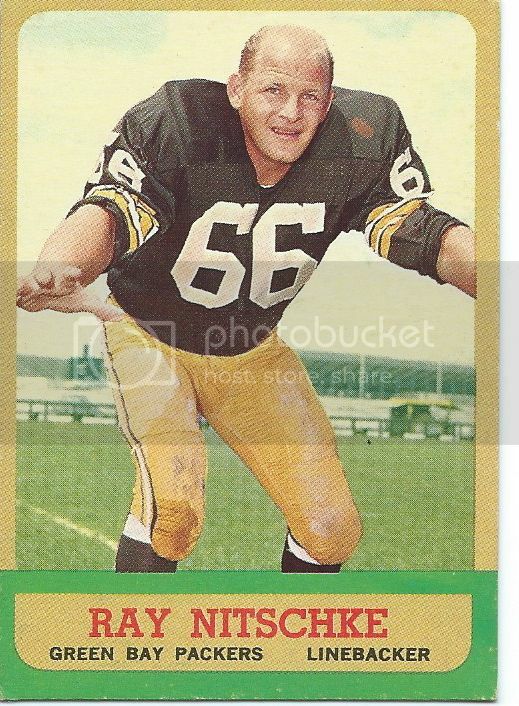 But in his showcase I see the card I have been looking for, a 1963 Topps #96 Ray Nitschke RC and he gives me a price of $15 which I accept. Congrats, Larry! Finishing a set like that is a major accomplishment. Great job.